The last few years have seen an unprecedented boom in the cryptocurrency market along with an ever expanding array of regulatory and compliance mandates. To thrive in the competitive cryptocurrency market, digital asset exchanges and technology providers must execute transactions not just at blazing fast speeds, but also at scale while strictly maintaining accuracy throughout the entire lifecycle of blockchain-based digital assets. The world’s established financial markets have perfected the science of high-frequency trading over the years. And now crypto asset markets which consist of funds, exchanges, options, trade-bot API’s, and brokers are following suit. High-frequency trading platforms allow traders to execute millions of orders and scan multiple markets and exchanges in a matter of seconds, thus giving the institutions that use the platforms a huge advantage in the open market. Cryptocurrency trading, although still in its infancy, has already proven to be extremely volatile relative to other established financial markets. The adoption of HFT has raised the frequency and volume of cryptocurrency trading even further, making it increasingly harder to execute high volume trades consistently and on time while maintaining regulatory standards. In this benchmark, we tested VoltDB v8.3 in the cloud and observed the performance scale linearly with the number of servers and achieve over 3 million transactions/second with latency consistently in single digits. Why VoltDB for Crytocurrency Trading? Cryptocurrency trading requires the analysis and execution of trades in milliseconds; a latency of a mere millisecond could lead to potential losses of millions of dollars. The need for real-time transactions is very real and VoltDB provides just that. With its in-memory distributed architecture along with built-in stored procedures, User Defined Functions, and materialized views, VoltDB has been powering demanding financial instruments and cryptocurrency trading platform for years now. Read more about VoltDB’s real-time architecture. A survey conducted in partnership with Research Now confirms that for financial data (such as cryptocurrencies), having consistent critical data transactions without compromising on speed is vital to their business. To maximize profit, you need to have the correct price information quickly. Inconsistent data here means that you lose out on potentially large profits or make bad trades. Regulatory requirements also require trading platforms to transactional data correctly and quickly; failing to meet compliance could lead to losing your trading license. VoltDB partitions run independently and provides for the strongest ACID semantics available, ensuring that data is always accurate and reliable. While NoSQL solutions offer “eventual consistency”, which means that the likelihood of getting an incorrect response to a query at at given time is high, this is simply not acceptable for any financial services use case. Demand for cryptocurrency coupled with volatility causes high trading volumes along with unpredictable spikes resulting in millions of transactions per millisecond. The embedded database within the trading platform needs to scale linearly to accommodate for trade volume spikes, while continuing to deliver predictably low latency and remain highly available. VoltDB automatically partitions data across the cluster, keeping multiple copies of all data to ensure high-availability and data safety. Partitionable transactions are scaled linearly with cluster size. So just how scalable and fast is VoltDB? 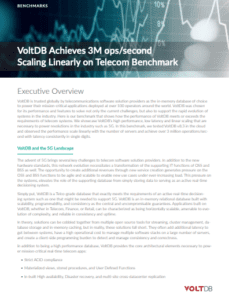 A recent benchmark performed on a demanding telecom-grade app with XDR data showed VoltDB can easily scale beyond 3 million transactions per second with under 3 milliseconds of 99% predictable latency. 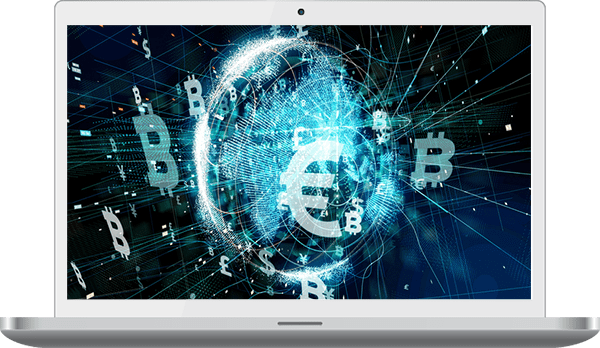 HFT employs algorithmic trading programs that enable traders to make thousands of completely automated trades in real-time, often multiple times in the trading day. VoltDB can operationalize complex Machine Learning algorithms in real-time with in-database Machine Learning. VoltDB automatically converts a PMML model into an executable process as a User Defined Function that can apply the pre-defined complex logic to take real-time actions on high volumes of fast streaming data. Pre-compiled server-side stored procedures make the in-memory database execution times even faster by running complex logic on cryptocurrency transactions at scale and with ease. Cryptocurrency exchanges are cloud-native. VoltDB is architected to provide horizontal scale by clustering on commodity hardware, with hardware and networking fault-tolerance built-in. This ensures seamless operations on any of the public clouds (AWS, Microsoft Azure, Google Cloud Platform, Alibaba, etc) or even private or hybrid clouds. At its core VoltDB is a fully ANSI SQL compliant relational database. Support for standard SQL ensures ease of use and fast deployment.